Ha. I feel like a chump. I've gone on and on about how Microsoft have the Xbox advantage over Google when it comes to control of the most important scene in the house - the TV screen. I've always believed that gaming would be an ace Bing could play against Google. Did I expect it to come in the form of casual games like Bejeweled 3, Plants vs Zombies, Klondike Solitaire or any one of the otehr 46 free games that are being added to Bing? No. That's exactly what's happening. Mind you, Bing UK say it's "due to popular demand". Hmm. Not sure about that. What it means is people on their lunch break have a reason to head off to Bing. They can play these games. That'll get them on Bing. That's a huge start. 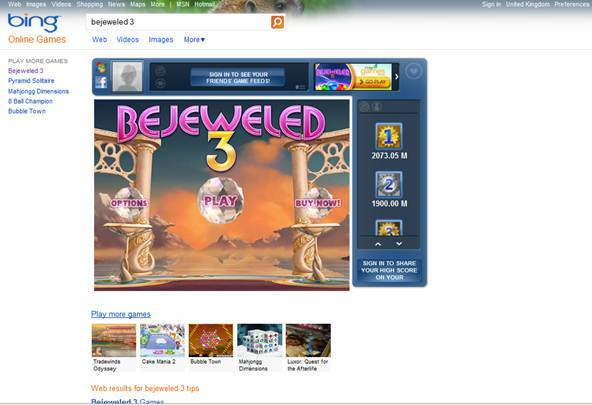 Since Bing’s inception, games have been a popular search term with our users. Allowing our users to get to their favourite games in quickest possible time, playing the games right through the search results page, we’re excited to make these great casual games available on Bing. Will this compete with Facebook? I think it might. A little. However, it is possible to sign into these games with Facebook Connect (or via Windows Live) and compete against your friends scores. I don't think you get to compete against your friends in a multiplayer; not yet, just against the scores. What do you think? An attention grabbing strategy with wisdom from Bing, or not?